SALE NOW ON!! - BUY NOW AND SAVE!! 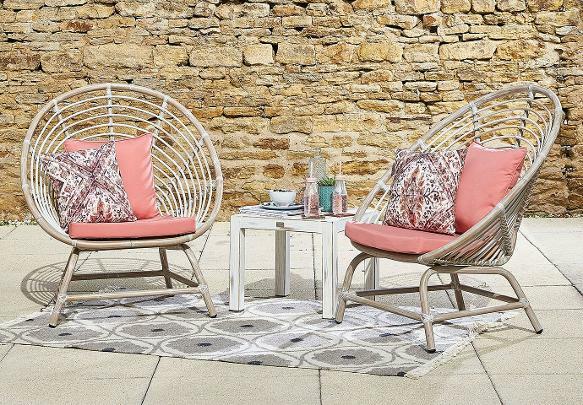 The ever popular Fresco collection has even more to offer this year with an extensive choice of affordable furniture sets especially created for your outdoor use. There are two distinct design features on sofas, armchairs and corner units a contemporary boxy shape or an elegent curve. 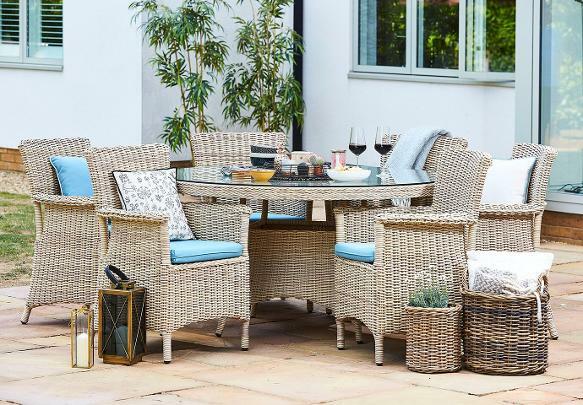 Options include, corner sets, casual dining combining a table with the sofas, lounging sets with coffee tables and storage, and 4/6 seater round tables to team up with elegant carver chairs, Bistro Sets and Sun Loungers are also available. 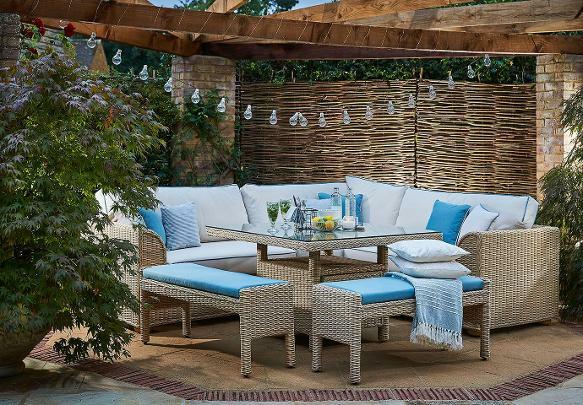 Fresco frames are powder coated aluminium and the polyethylene rattan weave is water and UV resistant and available in a dark or pale grey. 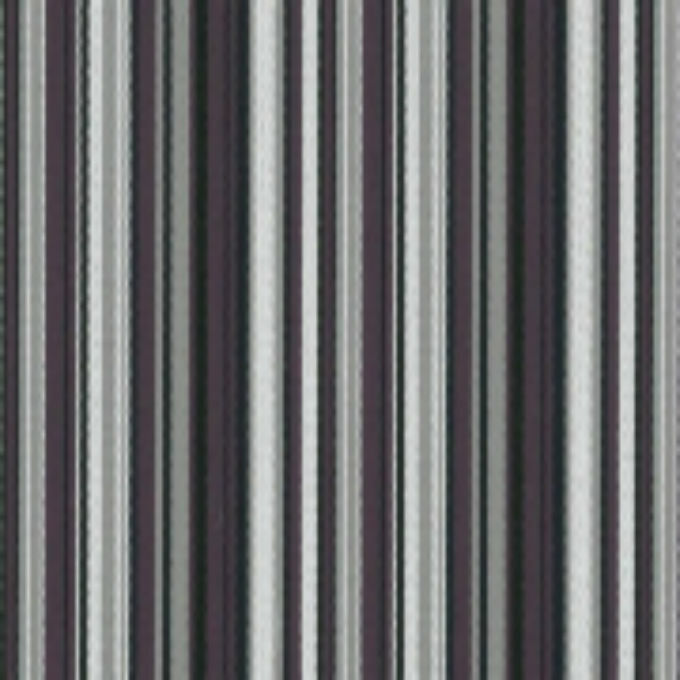 Cushions (which come in choice of 2 attractive colours to complimemnt your choice of weave) are also water and UV resistant and compliant with UK fire regulations. 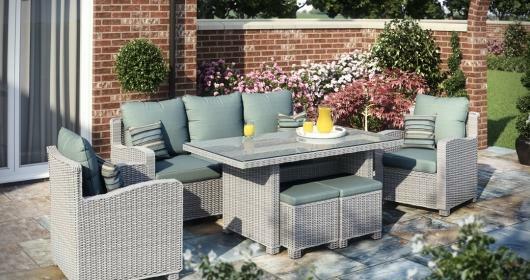 All Lounging and Dining Sets come with Weather Covers and a 3 year frame warranty. 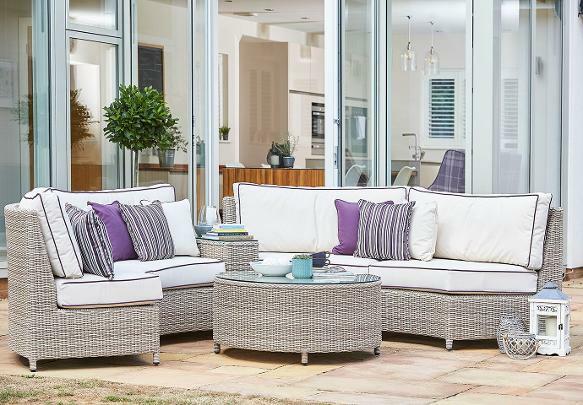 The Auckland is Daros' most comprehensive outdoor living range offering Lounging, Dining and Occasional options. 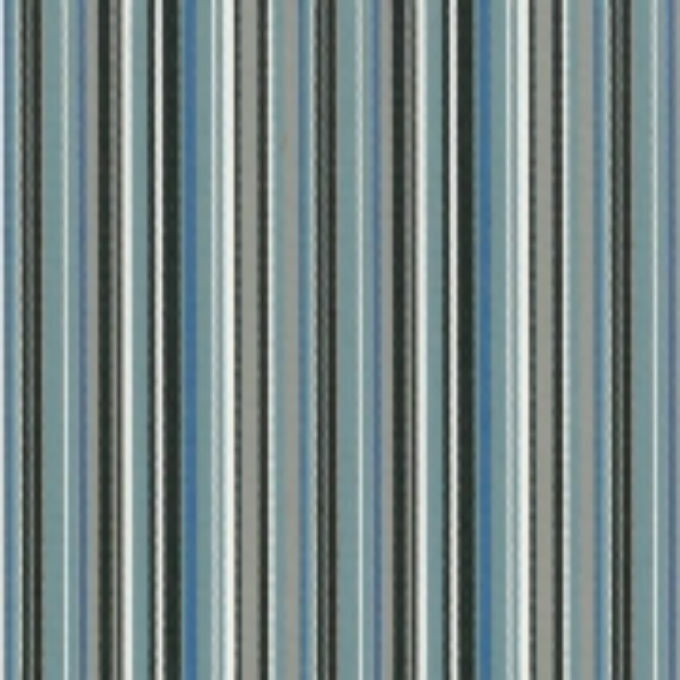 The Light Bonano weave allows it be mixed seamlessly with the Hamilton range. 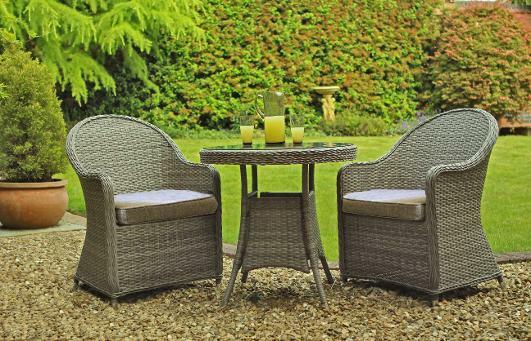 Create a cosy corner in any area of your patio or garden with the Lunas' unique curved set. The arc shaped sofas provide plenty of seating and combine with a practical arm-height table. a large central coffee table snd a leg rest. 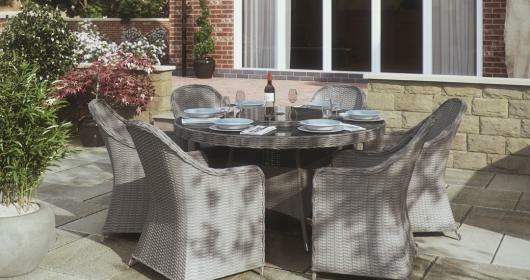 The Auckland 170cm Dining set is a stunning set of garden furniture. 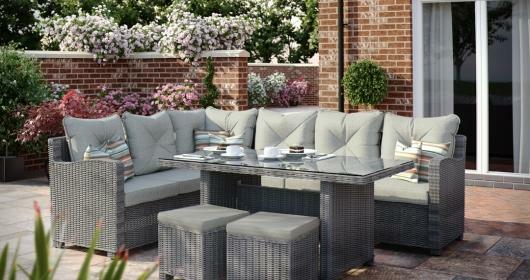 Like all of Daros' garden furniture it is stain and water repellent and therefore suitable for year round use. This range looks stunning with the Auckland Dining bench, a bench suitable to seat two or three people at any one time. Along with the Auckland Dining chairs there is plenty of space and seating to entertain a group of guests or dine with your family. The ultimate in outdoor lounging, this modular set allows the flexibility to configure a seating group which suits your available space and requirements precisely. Based around a corner chair you can add your choice of modular chair and sofas as required, complemented by a glass topped coffee table and relaxing leg rest, this group gives a truly sumptuous impression. 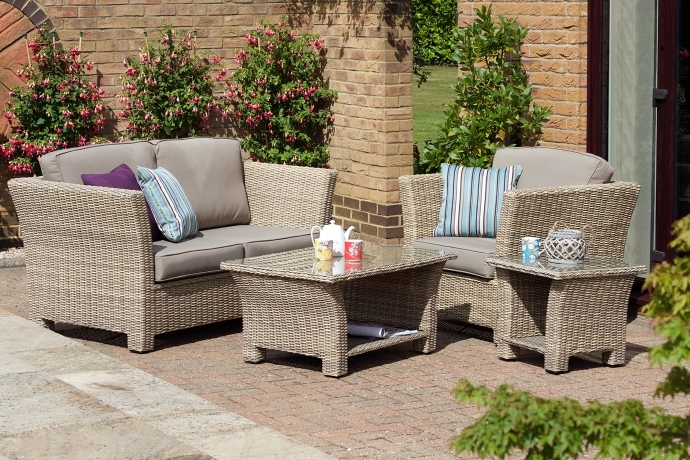 Woven using 6mm Tisse® round core in Light Bonano, this luxurious group will provide years of lounging pleasure. The Havana Chair finished in a fresh white wash colour, combines comfort with clean lines, it is suitable for indoors and outdoors. Havana brings the much loved Peacock chair into the 21st Century.